Options are lovely. Both the brand of hot chocolate and choices. Sometimes you want to fall down cliffs and then climb back up them again while wolves chase you and men with guns shoot said guns right at your face. Other times you want to befriend ancient deities and solve puzzles with them. So it’s rather nice that, with Lara Croft, we can enjoy both. 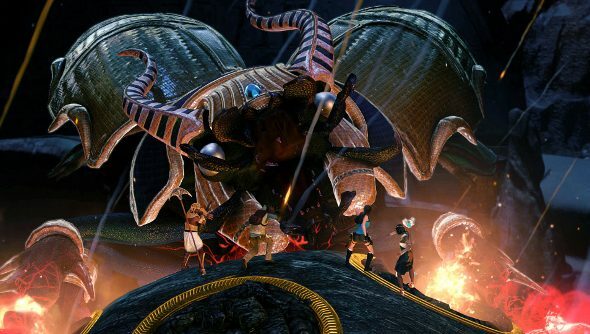 Lara Croft and the Temple of Osiris was a pleasant surprise at E3 this year, and now we’ve got a release date for it. Crystal Dynamics’ second foray into the world of co-operative puzzle solving will launch on December 9th. Temple of Osiris sees our stalwart hero team up with fellow gun-toting archeologist Carter Bell and mother and son duo, Isis and Horus. While it can be played in single-player, allowing adventurers to switch between the different heroes to exploit their abilities, the focus is on 4-player co-op. Bell and Croft can use guns, grappling hooks and torches, while the gods have appropriately magical abilities and fancy staffs. Their talents will need to be used in conjunction with each other to solve the Egyptian conundrums. Here’s the developer walkthrough from E3 again, showcasing the action and puzzle solving.